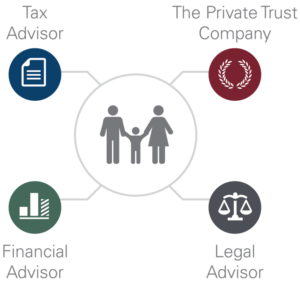 The Private Trust Company (PTC) is an independent trust company dedicated to the administration of trusts and other family wealth arrangements such as family offices, businesses, and foundations. We serve the clients of our trusted partners—financial advisors, attorneys, and CPAs and accounting professionals—who rely on us to provide high quality service and dedicated expertise across all aspects of trust administration. Our unique model enables clients to continue working with the professional advisors they rely upon to place their interests first, and empowers our professional partners to attract and retain a greater number of high-value client relationships. PTC specializes solely in providing administrative fiduciary services and currently serves in a fiduciary capacity for over $100 billion in assets. Licensed in all 50 states under its national banking charter, the bank does not engage in any lending or deposit taking, therefore focusing solely on our core expertise of providing fiduciary services. PTC is regulated and examined by the Office of the Comptroller of Currency, a division of the U.S. Treasury Department, and is a member of the Federal Reserve Bank. Independent auditors audit PTC while its accounts are privately insured and bonded to protect client assets. The Private Trust Company does not provide day-to-day investment management for trust assets. Instead, PTC enables clients to maintain their relationship with their financial advisors for investment management. PTC serves in an administrative corporate trustee role making certain that trusts are managed and distributions occur according to the terms of the trust document. PTC also provides all record keeping, accounting, and tax preparation services for the trust. Offering maximum flexibility, working with clients and their financial advisors. Choose to work exclusively with your financial advisor, or work collaboratively with the full expertise of the PTC team. Integrating seamlessly into your wealth management team, PTC keeps the process of delivering key communication and statements running smoothly between clients and professional advisors. Helping clients develop written investment policy statements so all parties have a clear and consistent understanding of goals, objectives and guidelines for the trust. Accounts are reviewed regularly and investment policies are revised to reflect changes to the portfolio, client circumstances and financial markets. While state laws govern the construction and validity of a trust, PTC administers many trusts under Ohio law due to its consistent, fair and flexible legal and tax environment. Experienced and knowledgeable trust officers bring backgrounds in law, accounting, banking, investment management, tax and business. Trust officers are friendly, discreet, and sensitive to family dynamics. A team of trust officers and trust specialists are available to you and your financial advisor when you need them. An organizational commitment to excellence, integrity, transparency, and collaboration permeates all levels of the organization and governs all actions and interactions. Chartered as a national bank, PTC is devoted solely to trust services for families. PTC provides trust services in all 50 states. Regulated and examined by the Comptroller of the Currency, audited by independent auditors and bonded to protect your assets. As a subsidiary of LPL Financial Holdings, Inc. we are backed by substantial resources and a long-term commitment to independent financial advisors and their clients.